Most habitats on Guam, including forest, savanna, scrub, secondary grassland, fern thickets and agricultural areas, foraging along field edges and roadsides. 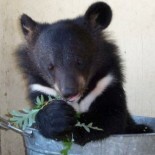 They are omnivorous, eating leaves, seeds, fruits, small lizards, bird eggs, small mammals, and carrion. How Long Guam Rails Live: 10-30 years. 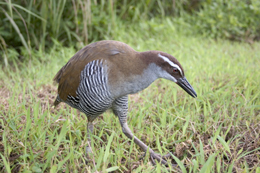 Due to predation by the invasive brown tree snake (Boiga irregularis) and feral cats, the Guam rail became extinct in the wild in the early 1980’s. It survived only in captive-breeding facilities in Guam and in 14 zoos in the USA until reintroduction to the wild activities began. From 1989-2007, 853 captive reared rails were released on nearby Rota, Northern Mariana Islands (to USA). In 2011, 16 rails were released on Cocos Island, a small island off the southern tip of Guam, after rats were eradicated from the island. Evidence of breeding has been observed. Zoos in the U. S. that currently participate in the Association of Zoos and Aquariums Species Survival Plan are Cincinnati Zoo & Botanical Garden, Lincoln Park Zoo, Fresno Chaffee Zoo, Santa Fe Teaching Zoo, Louisville Zoological Garden, Milwaukee County Zoo, National Zoological Park Conservation and Research Center, Smithsonian National Zoological Park, Oklahoma City Zoological Park, The Philadelphia Zoo, National Aviary in Pittsburgh, Racine Zoological Gardens, San Antonio Zoo, San Diego Zoo, San Diego Wild Animal Park and Sedgwick County Zoo. Here is a video that explains the conservation activities that led to the 2011 release of 16 rails. Maymie, since I lived on Saipan–just about 200 miles from Guam–when I was a little girl, this is particularly interesting to me. In terms of island ecology, it also shows how aspects of human inhabitation plays out. Very interesting. I hope the release works. Me too, Neva. In the animal world, there are so many long running sagas to monitor with trepidation. This little flightless bird seems to have some pretty strong advocates in its corner so I feel pretty hopeful. This entry was posted on June 29, 2014 by Maymie Higgins in Birds, Extinct in the Wild, Maymie Higgins.